Testuya was born at Tohgane, Chiba in 1973. He started playing the tuba at elementary school. His middle school made the final of all Japan Band Competition and he won the first place in the wind and percussion solo competition in Chiba when he was a high school student. He attended Tokyo University of Arts and he was fifth place in the Japan Wind and Percussion Competition. Since then he distinguished himself as a brilliant player. He finished his Master degree there and joined Sendai Philharmonic after graduation. He was third place in the 15th Japan Wind and Percussion Competition and second place in the same competition. Tetsuya studied in Chicago for one year as a dispatch of Affinis foundation. He took lessons from Rex Martin (professor of tuba at Northwestern University), Gene Pokorny (principal tuba at Chicago Symphony Orchestra), Floyd Cooley (former principal tuba at San Francisco Symphony Orchestra), Mike Roylance (principal tuba at Boston Symphony Orchestra) and Roger Rocco. He studied with them not only tuba performance but also brass teaching method. After staying States, he moved to Tokyo Philharmonic Orchestra and performed many of great conductors including Cheong Myeonghun. Also as a member of the resident orchestra at New National Theatre, he has wonderful opera and ballet experience. Tetsuya does not remain in his present post. He also performs as a studio artist and recorded a lot of movie music, TV music and game music. Also as a chamber musician he is a member of Emanon brass quintet and Tuba-labo. As a soloist, Tetsuya regularly performs solo works. He played concertos by R.V. Williams, E. Gregson and J. Williams with Sendai Philharmonic Orchestra. He plays many orchestra and wind ensembles in Japan as a guest artist. As a teacher, Tetsuya is very active person. He made many students succeeded. Tetsuya had many master classes all over the place and he gave lessons in Korea in 2008. 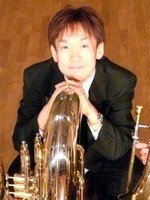 He teaches at Toho College of music since and Musashino Academia Musicae. As a conductor, Tetsuya conducts amateur wind ensembles and trained them frequently. Now he is music director of Funabashi Wind Ensemble which founded 1955 in Chiba.